Create an inviting atmosphere with warm lighting and holiday décor that complement the style of your home. What is the best way to add more lighting in my dark brown, 15-by-22-foot living room? It has western exposure and only one set of sliding glass doors. To determine how much light is needed, multiply the square footage of the room by three if using incandescent lighting, or multiply by one if using all CFLs. A 15-by-22-foot room equals 330 square feet, which equals 990 watts of incandescent light, or 330 watts of fluorescent light. To get answers to all your home lighting questions, contact an Hortons showroom. A year from now, incandescent, compact fluorescent and LED light bulbs must meet more stringent lumens/watt requirements. Bulbs will be required to produce the same amount of lumens (brightness) for less wattage (energy). These changes go into effect Jan. 1, 2012, across the United States, except for California. In California and British Columbia, new energy efficiency standards for bulbs are launching now, and will be in effect by Jan. 1, 2011. Additionally, in an effort to make it easier for consumers to compare traditional incandescent bulbs to more efficient bulbs, such as compact fluorescent lights (CFLs), bulb packages will be required to state the number of lumens as well as the estimated yearly energy cost for that particular type of bulb. The labeling changes must be made by mid-2011. Similar labeling changes for Canada will be in place by Jan. 1, 2012. Visit a Hortons showroom to learn more about new requirements and labeling changes for light bulbs. Entertaining during the holidays? A few details can make a big difference in the success of your gathering. There are small, yet effective, lighting changes you can make that do not require a large budget. Think about the path your guests take as they enter your home. 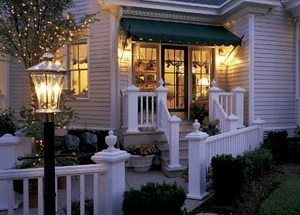 To create a welcoming and intimate environment, try using flicker flame bulbs on the front porch to create an old town, gas lantern look. It will be inviting and warm, without competing with any holiday lighting. Inside your home, the easiest change for maximum impact is to install dimmers. They are ideal for creating that perfect look, by allowing the general lighting to play a supporting role. For example, a foyer chandelier typically provides much more light than is required for most daily activities – and it certainly provides more illumination than necessary when guests arrive. For help with lighting selection or dimmer placement, just ask a professional lighting specialist at any Hortons Home Lighting showroom.